Hawaiʻi Island police are searching for a 35-year-old man wanted on a $1,000 bench warrant for contempt of court. 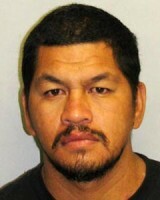 Josiah Ikaika Konanui has no permanent address but frequents the Puna area. He is described as 5-foot-11, 185 pounds with brown eyes and black hair. He is also wanted for questioning in connection with a burglary. Police ask anyone with information on his whereabouts to call the Police Department’s non-emergency line at 935-3311 or contact Detective Royce Serrao at 961-2272 or rpserrao@co.hawaii.hi.us.